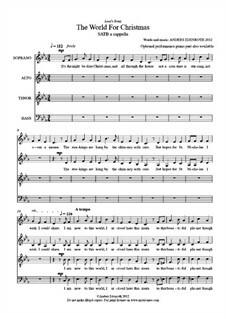 Christmas song in SATB with optional pianopart available separately. Originally recorded and released by Swedish a cappella ensemble THE REAL GROUP in 2012. With the well known American poem "Twas the night before Christmas" as a background setting, the song delivers a message of global concern and sings praise to our beautiful planet. The fairly easy score with no extreme ranges in any part still offers the choir or small vocal ensemble many artistic possibilities. Das ist ein wunderschönes Lied! Ihr singt sehr schön! Ich bin sehr begeistert! Viel Erfolg für ihre Gruppe!!! !